Grow on...You know it makes sense! 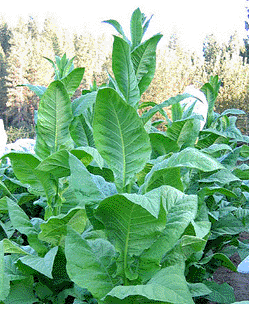 Do you want to grow and make your own cigarette, cigar or pipe tobacco ? 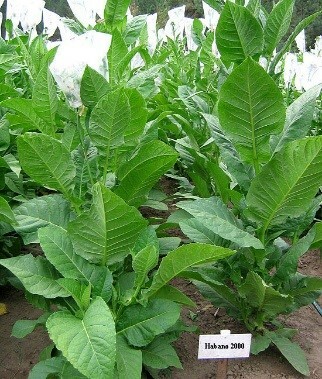 We have a collection of over 60 of the world's finest varieties of tobacco seeds for you to grow at home. 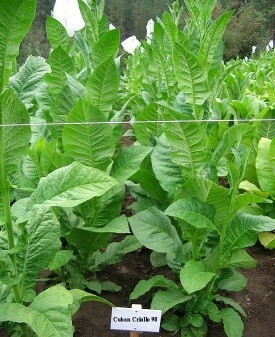 Growing your own tobacco isn't against the law, no matter which country you live. And let's be honest, the price of tobacco is never going to go down, is it? We have an impressive collection, carefully chosen with the smoker in mind. And with free, easy to follow, step by step instructions, all you need to do is provide the garden! including Bitcoin. Litecoin. Zcash payments. Browse through our Top 10 Varieties now on sale (below), or choose from the Menu. 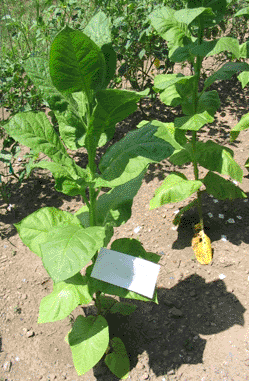 A medium flavored Maryland type tobacco that grows to 6 feet in height and produces very large leaves to 36" long and 18" wide. It air cures to a light reddish brown color. 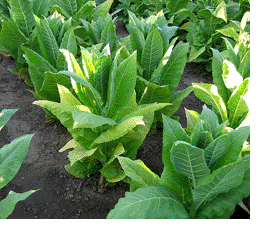 Maryland tobacco is commonly used as a blender. Matures in 55-60 days. Harrow Velvet is a medium flavored Burley with excellent curability and a short aging time. Columnar plant form with tightly spaced leaves which are very uniform in size. Almost no suckering. Leaves average 24" in length by 14" wide and turn a golden yellow as they ripen. Mature in 65-70 days. Leaf cures to a medium brown. This plant carries what I think is a great name for a tobacco, don't you think? Another very popular Cuban cigar variety. Will grow up to 6-7 ft. tall. It's leaves are longer, more slender and slightly darker than the Habano 2000. It's cured leaves have a silky texture making it a good covering for cigars. It has a pleasant, mild aroma and taste. 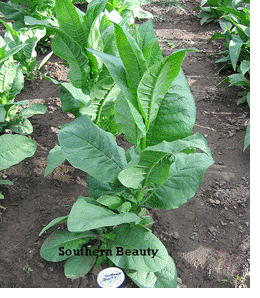 Southern Beauty is an heirloom bright leaf which is quick and vigorous grower to over 6 feet. Leaves are light in color and grow to 30" long and 16" wide. Matures in 55 days and gives very good yields. Air cures to a golden yellow. Developed in Canada by crossing wild Rustica tobacco with two popular American varieties. 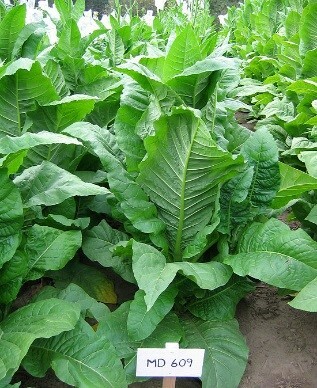 The result is a high-yielding, high-nicotine cultivar. It grows to 5 feet and produces large, wide, heavy grade light green leaves. 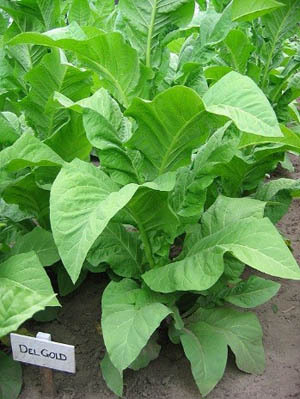 Del Gold is one of the best known varieties for commercial tobacco production. Matures in 70-75 days. One of the most popular varieties for cigar enthusiasts. This Cuban variety grows to about 5-6 feet tall and has wide, rounded leaves. When cured the leaves have a reddish to light brown color. It makes a great filler for cigars. Has a pleasant, mild aroma and taste. Green Brior is a full flavored heavy producing Burley that is a long time favorite of growers. It reaches a height of 6 feet, with light green leaves 24" long by 14" wide. Low suckering and matures in approximately 70 days. Mohawk Rustica is native to Central America as was widely cultivated by Native Americans and grown throughout the southern US. It grows to 3' in height and is similar to Aztec, but with less branching. The leaves are thick, dark green in color and are among the largest of any Rustica variety. The flowers are a bright yellow and are densely packed. 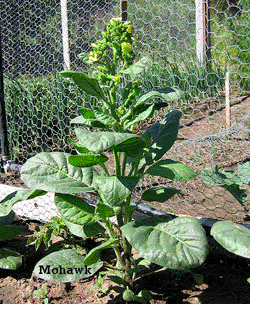 Mohawk, like other rustica varieties is very high in nicotine and is also used for making insecticide.